Place a bowl with a 10-inch diameter on a sheet of parchment paper lining a baking sheet. Trace a circle on the paper and set aside. Using a large bowl, beat egg whites and cream of tartar with a mixer on high until it begins to create peaks. Slowly pour in sugar while continuing to mix. Continue until the mixture is really stiff and glossy (about 5 to 7 minutes). Use a spatula to smooth the meringue on the parchment paper, using your trace as a guide. Gently create a shallow “bowl” in the middle so that the meringue almost resembles a nest. Bake until it appears dry (about 75 to 90 minutes depending on your oven). Turn off the oven and let it remain in the oven until completely cooled (about 5 hours). If possible, it’s even better if you make the night before and let it sit in the oven overnight. When you’re close to serving time, make the instant chocolate pudding following the directions on the box. Let sit in the refrigerator for about 5 extra minutes. 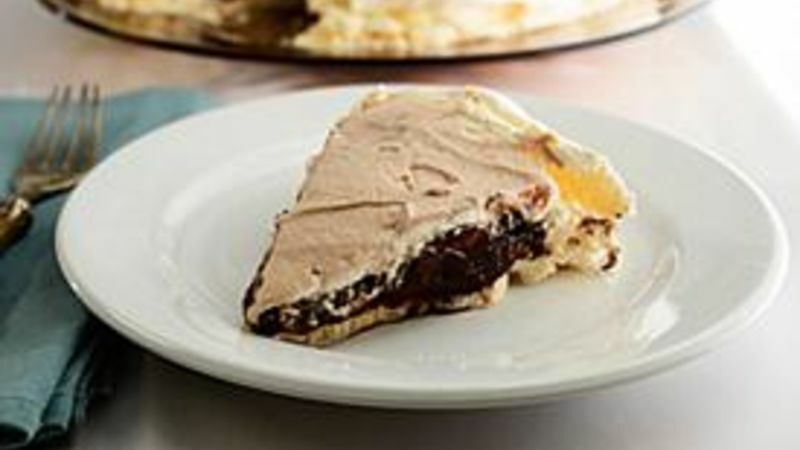 While pudding is setting, carefully peal your meringue off of the parchment paper and place on a serving platter. Fill with the chocolate pudding. Keep a little extra pudding if you choose to use in the next step. Finally, top with a homemade whipped topping. Store bought whipped cream will also work. If desired, add some of the reserved pudding to the whipped cream for a chocolate topping. Cut and serve immediately. I am thankful for many things this year, especially the three F's: Family, friends and food! I'm also thankful to share my love of food (and cocktails!) with you, my Tablespoon peeps. To show my appreciation on this day of thanks, here's a little extra treat to feast your eyes on while the body digests its T-day dinner delights. A Chocolate Pavlova. If you're not familiar, a traditional pavlova is a light meringue dessert that is usually topped with various fruits or lemon curd. I thought I'd try something a little different with a chocolate pudding filling. It's a little bit heavier than the traditional recipe, but with the marshmallow-y meringue crust and whipped cream topping...I'll give it a pass on the heavy. The meringue is really easy to make, it just takes some time and patience. Start out by preheating your oven to 200 degrees. Place a bowl with a 10-inch diameter on a sheet of parchment paper lining a baking sheet. Trace a circle on the paper and set aside. Using a large bowl, beat egg whites and cream of tartar with a mixer on high until it begins to create peaks. Slowly pour in sugar while continuing to mix. Continue until the mixture is really stiff and glossy (about 5 to 7 minutes). Use a spatula to smooth the meringue onto the parchment paper, using your trace as a guide. Gently create a shallow "bowl" in the middle so that the meringue almost resembles a nest. Bake until it appears dry (about 75 to 90 minutes depending on your oven). Turn off the oven and let it remain in the oven until completely cooled. If possible, it's even better if you make the night before and let it sit in the oven overnight. When you're close to serving time, make the instant chocolate pudding following the directions on the box. Let sit in the refrigerator for about 5 extra minutes. While this is setting, carefully peal your meringue off of the parchment paper and place on a serving platter. Fill with the chocolate pudding. Keep a little extra pudding if you choose to use in the next step. Finally, top with a homemade whipped topping. If you're looking for a quick fix, store bought whipped cream will work just fine. I added an extra layer of chocolate love by swirling in some of the reserved pudding into the whipped cream. Once completely mixed in, it looked really pretty next to the meringue crust. Now you're ready for some love. Cut. Serve. Enjoy! I hope your Thanksgiving is filled with love and thanks.